When winter rolls around in Indianapolis, there’s no reason to stay inside until spring. With a mix of exciting indoor and outdoor activities available, you’ll find plenty to do. When cabin fever starts to set in, check out the Indianapolis area to experience these fun winter activities. Duckpin bowling was invented in Baltimore, Maryland in 1900. Like traditional bowling, duckpin bowling features 10 pins. 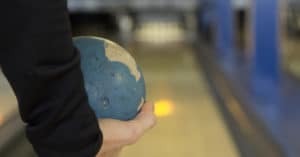 However, the pins are shorter and fatter, and the ball is also smaller. Since it’s much harder to get a strike or spare in duckpin bowling, you’re allowed three rolls instead of two on each turn. If you want to test your skill at this game, Action Duckpin Bowl is a restored duckpin bowling alley in Fountain Square. The alley has eight lanes, a vintage billiard table, and a cafe. When the temperatures dip below freezing, take the opportunity to check out the beautiful Veal’s Ice Tree. This massive ice sculpture was first created by accident in 1961. The family wanted to make an ice slide, but a strong wind blew the water onto honeysuckle bushes instead. The result was so unique and beautiful that they started spraying water on the bushes to create the ice tree. Today the ice tree gets between 35 and 40 feet high, and the family uses food dye in the water to create lovely colors in the ice. Whether you have kids or you simply want to feel like a kid again, winter in Indianapolis is a great time to go sledding. Fort Harrison State Park has one of the largest sledding hills in the city. Keep in mind there is an entrance fee to enter the park. Another good spot for sledding is Lawrence Community Park. The hill here is slightly smaller, making it a good option for young children. Additionally, there’s no entrance fee for this park. Winter is a great time to visit the Indianapolis Motor Speedway Museum because crowds are smaller and there’s still plenty to see and do. During your visit, you can view one of the largest collections of race cars in the world. However, the museum doesn’t just focus on race cars. You can also see motorcycles, dragsters, and other vehicles that have set world land speed records. The museum also offers a year-round narrated bus tour of the racetrack. If you need to see a little green during the winter, head to the Garfield Park Conservatory. This 10,000-square-foot greenhouse is home to hundreds of different tropical plants. Plus, even on the coldest winter days, it’s warm and balmy inside. While you’re there, check out the indoor 15-foot-tall waterfall, view the large collection of bromeliads and orchids, and check out what special events are happening. Make this winter the most fun and exciting one yet by checking out these top winter activities you can find around Indianapolis.